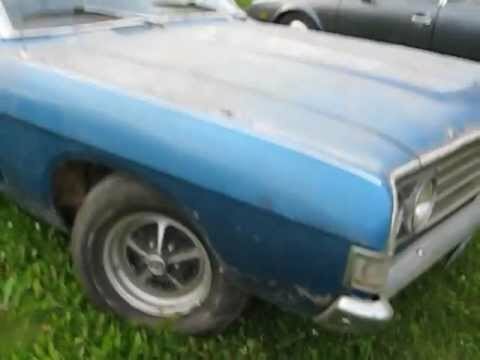 1969 Ford Fairlane Restoration: Lots of Body Work! File Name: 1969 Ford Fairlane Restoration: Lots of Body Work! This video shows how we restored Agent 8771's old, beat-to-death 1969 Ford Fairlane coupe. The car had been hit hard in the rear many years ago, and the frame rails were buckled. This, combined with the major structural rust throughout, made the car virtually unrestoreable. Agent 8771 didn't want to give up on the car however, and didn't want to just buy another similar unit and pretend it was his old car. I decided that we could replace the whole bottom half of the car with a solid, straight chassis from a low-mileage 4 door sedan. When one came along at a low price, we decided to get to work. We saved what we could from his original car, including the seats, doors, roof, parcel shelf, hood, decklid, and glass. We also used his old wheels, grille, bumpers, and even his old exhaust system with the "Thrush" mufflers that we used to put on our cars! When we were all done, it looked, sounded, and drove like his old high school car! He even took off the power steering and substituted his old manual box so that the car would drive just like it used to. Overall, a really fun project and it makes a great story to tell people you still have your first car, even if much of it has been "donated" by another Fairlane sedan! Anyhow, I hope you enjoy a tour of this project; let me know what you think! Thanks for watching!